AMAZON GREAT INDIAN SALE,Big discount will be available on these products starting from Jan 20 - mobilereview.online - The Ultimate resource for mobile phones reviews, specification, information. For the Prime member of the Amazon, this cell will start from January 19 from 12pm in the afternoon. 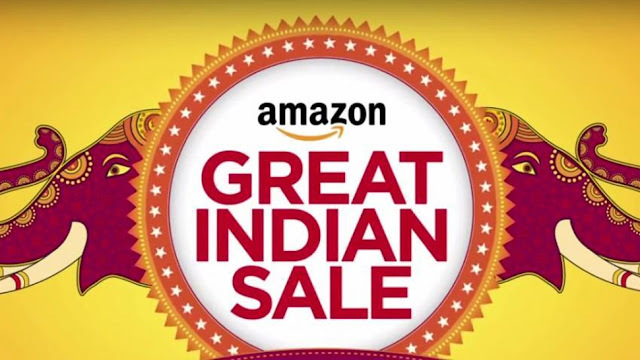 Amazon is going to launch Amazon Great Indian Sale from Jan 20, which will run till January 23. If you were waiting for a sale to buy a product, then your wait is about to end. There are many special offers for customers in this Amazon Great Indian Sale. Amazon is starting this cell in collaboration with HDFC Bank. This means that customers who have card with HDFC Bank will be given a discount of 10% while shopping. According to the information, this instant discount will be available to both the debit card and credit card holder. Customers will also have an EMI option for shopping. Amazone has started talking about the offers in the Amazon great indian sell starting January 20. Customers will get more than 100 million products in Amazone Great Indian Sale. Let us know that all this product will be available on No-Cost EMI for shopping. This sell can be a great opportunity to shop for a fashion product, as people are expected to get a discount of 80% or more on fashion products. This sell, which runs from January 20 to January 23, will get a discount of 60 to 80 %. During the Sale, Amazone is also offering free home delivery on its first order of new customers. Amazone can give great offers on electronic gadgets in the upcoming sell. In this sell, there can also be an Exchange offer with no-cost emi on the smartphone. Amazon will get discounts up to 60 % on laptops, headphones, cameras and hard drives, among other products. Amazon is offering 50 % discount on TV and home appliances. Up to 75% discount on Home and Kitchen shopping In this category more than 50,000 products will be available at half price or less. In Amazon Great Indian Sell, the OnePlus 6T smartphone will offer Redmi Y2 and Huawei Nova 3i with great exchange offers at affordable prices to customers. Customers will find attractive deals on big brands of products such as Vivo, OnePlus, Realme, Xiaomi, Philips during the sale. However Amazon has not disclosed the real price of any products.